Attributed to Utagawa Yoshitaki. 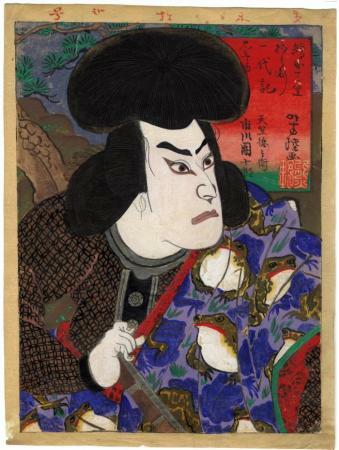 This painting is a depiction of Ichikawa Danjūrō in the role of a villain with a large wig and a kimono with toads. This may be a role from the kabuki drama "Jiraiya" and represents the evil toad wizard. This painting is in gofun pigments on Japanese mulberry paper, with black lacquer on the armor and silver on the neck area. The toad pattern is particularly skillful, with the purple shadows of the frogs alternating with brown and white toads.